Introduction: Successful weight loss after laparoscopic Roux-Y gastric bypass (LRGBP) hinges on many elements including neurohormonal, anatomical, and postoperative behavioral changes. To date, the effects of socioeconomic factors have been poorly studied. 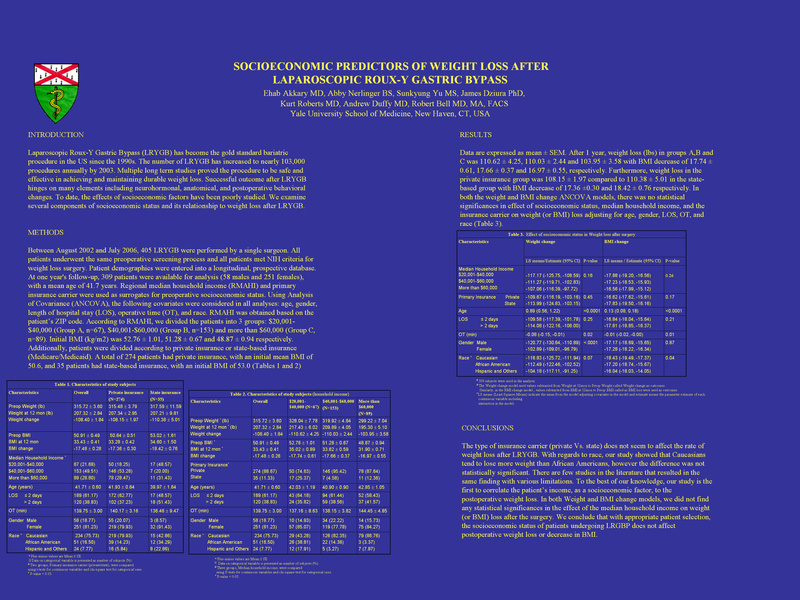 We examine several components of socioeconomic status and its relationship to weight loss after LRGBP. Methods: Between August 2002 and July 2006, 405 LRYGB were performed by a single surgeon. All patients underwent the same preoperative screening process and all patients met NIH criteria for weight loss surgery. Patient demographics were entered into a longitudinal, prospective database. At one year’s follow-up, 309 patients were available for analysis (58 males and 251 females), with a mean age of 41.7 years. Regional median household income (RMAHI) and primary insurance carrier were used as surrogates for preoperative socioeconomic status. Using Analysis of Covariance (ANCOVA), the following covariates were considered in all analyses: age, gender, length of hospital stay (LOS), operative time (OT), and race. RMAHI was obtained based on the patient’s ZIP code. According to RMAHI, we divided the patients into 3 groups: $20,001-$40,000 (Group A, n=67), $40,001-$60,000 (Group B, n=153) and more than $60,000 (Group C, n=89). Initial BMI (kg/m2) was 52.76±1.01, 51.28±0.67 and 48.87±0.94 respectively. Additionally, patients were divided according to private insurance or state-based insurance (Medicare/Medicaid). A total of 274 patients had private insurance, with an initial mean BMI of 50.6, and 35 patients had state-based insurance, with an initial BMI of 53.0. Results: Data are expressed as mean ± SEM. After 1 year, weight loss (lbs) in groups A,B and C was 110.62 ± 4.25, 110.03 ± 2.44 and 103.95 ± 3.58 with BMI decrease of 17.74 ± 0.61, 17.66 ± 0.37 and 16.97 ± 0.55, respectively. Furthermore, weight loss in the private insurance group was 108.15 ± 1.97 compared to 110.38 ± 5.01 in the state-based group with BMI decrease of 17.36 ±0.30 and 18.42 ± 0.76 respectively. In both the weight and BMI change ANCOVA models, there was no statistical significances in effect of socioeconomic status, median household income, and the insurance carrier on weight (or BMI) loss adjusting for age, gender, LOS, OT, and race. Conclusion: With appropriate patient selection, the socioeconomic status of patients undergoing LRGBP does not affect postopeative weight loss or decrease in BMI.